BAGHDAD (Reuters) - Iraq has begun court proceedings against 14 suspected French members of the Islamic State (IS) jihadist group captured by U.S.-backed forces and transferred to Iraq from Syria last month, two legal sources said. The men appeared before an investigative judge of Baghdad's anti-terrorism court on March 6 in a procedural step toward putting them on trial, according to a court-appointed lawyer who attended the session and a member of the judicial council. All 14 signed confessions saying they had been in Mosul when it was under Islamic State rule from 2014 to 2017, according to the two legal sources, speaking on condition of anonymity. "The course of investigations and indictment are leaning towards handing them the death sentence eventually," said the court-appointed lawyer. Islamic State redrew the map of the Middle East in 2014 when it declared an ultra-radical Sunni Islamist "caliphate" spanning parts of Syria and Iraq and established a rule known for mass killings, sexual enslavement and punishments like crucifixion. 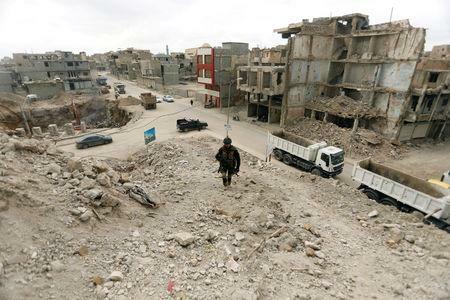 Security sources said the 14 stand accused by the Iraqi National Intelligence Service of carrying out "terrorist acts" in Mosul and running some of Islamic State's financial affairs. Iraqi officials have said they will either help repatriate non-Iraqi IS detainees to their home countries or prosecute those suspected of having committed crimes against Iraqis. Another confession, of a Frenchman of Algerian origin, said he left France for Turkey and then Syria in 2013 after being watching jihadist videos online, and then joined IS in Mosul. Baghdad-based security analyst Hisham al-Hashimi, who advises the government on Islamic State, said that the 14 Frenchmen were unlikely to have held senior positions in IS.